USES: This medication is used on the skin to treat a certain skin disorder known as rosacea, a type of adult acne. It may help to decrease redness, swelling and the number of pimples caused by rosacea. This medication is an antibiotic. 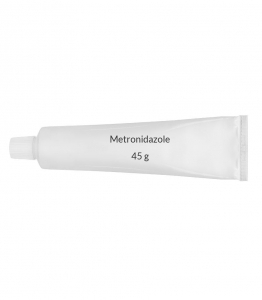 For the treatment of rosacea, metronidazole is believed to work by decreasing swelling (inflammation). Some brands of this medication also contain sunscreens (see also Notes section). HOW TO USE: Use this medication on the skin only. Wash and dry your hands before and after applying this medication. Wash and dry the area to be treated. Wait 15 minutes, then apply a thin layer of medication usually once or twice daily, or as directed by your doctor. Wait 5 minutes before applying cosmetics. Avoid using this medication around the eye area, unless directed by your doctor. Watery eyes or tearing of the eyes may occur if this medication is applied too close to the eyes. Avoid getting this medication in your eyes. If this occurs, rinse your eyes with large amounts of cool water. Use this medication regularly in order to get the most benefit from it. Remember to use it at the same times each day. It may take about three weeks before any improvement is seen, and up to nine weeks for full benefit. If no improvement is seen after three weeks, consult your doctor. SIDE EFFECTS: Stinging, burning, skin irritation, dryness, redness, metallic taste, nausea, or headache may occur. If any of these effects persist or worsen, notify your doctor or pharmacist promptly. Remember that your doctor has prescribed this medication because he or she has judged that the benefit to you is greater than the risk of side effects. Many people using this medication do not have serious side effects. Tell your doctor immediately if you have this unlikely but serious side effect: tingling or numbness of the hands and feet. A very serious allergic reaction to this drug is unlikely, but seek immediate medical attention if it occurs. Symptoms of a serious allergic reaction may include: rash, itching/swelling (especially of the face/tongue/throat), severe dizziness, trouble breathing. This is not a complete list of possible side effects. If you notice other effects not listed above, contact your doctor or pharmacist. In the US - Call your doctor for medical advice about side effects. You may report side effects to FDA at 1-800-FDA-1088. In Canada - Call your doctor for medical advice about side effects. You may report side effects to Health Canada at 1-866-234-2345. PRECAUTIONS: Before using metronidazole, tell your doctor or pharmacist if you are allergic to it; or to other nitroimidazole antibiotics (such as tinidazole); or to other ingredients in this product; or if you have any other allergies. This product may contain inactive ingredients, which can cause allergic reactions or other problems. Talk to your pharmacist for more details. Before using this medication, tell your doctor or pharmacist your medical history, especially of: blood disorders (blood dyscrasias). This medication should be used only when clearly needed during pregnancy. Discuss the risks and benefits with your doctor. This drug passes into breast milk. Discuss the risks and benefits with your doctor before breast-feeding. DRUG INTERACTIONS: Your healthcare professionals (e.g., doctor or pharmacist) may already be aware of any possible drug interactions and may be monitoring you for it. Do not start, stop or change the dosage of any medicine before checking with them first. Before using this medication, tell your doctor or pharmacist of all prescription and nonprescription/herbal products you may use, especially of: "blood thinners" (e.g., warfarin). This document does not contain all possible interactions. Therefore, before using this product, tell your doctor or pharmacist of all the products you use. Keep a list of all your medications with you, and share the list with your doctor and pharmacist. NOTES: Do not share this medication with others. This medication has been prescribed for your current condition only. Do not use it later for another condition unless told to do so by your doctor. A different medication may be necessary in those cases. Sun exposure can worsen rosacea. Limit exposure to the sun by wearing a wide-brimmed hat and using a sunscreen that is SPF 15 or greater. If your brand already contains a sunscreen, you should use a regular sunscreen (without the metronidazole) on areas of skin not treated with this medication. Avoid certain triggers that may worsen rosacea such as wind, hot beverages, spicy foods, alcohol, and extreme cold. Discuss with your doctor. STORAGE: Store at room temperature between 68-77 degrees F (20-25 degrees C) away from light and moisture. If using the lotion, do not freeze. Do not store in the bathroom. Keep all medicines away from children and pets. Do not flush medications down the toilet or pour them into a drain unless instructed to do so. Properly discard this product when it is expired or no longer needed. Consult your pharmacist or local waste disposal company for more details about how to safely discard your product.